Read EeZee Kricket Archives of Older Product Reviews by TDmonthly. eeZee kricket Inc is a an exciting new company which produces the innovative, challenging and award winning cricket trivia board game eezee kricket. Eezee kricket is easy to play, engaging fun for the complete family, brings people together and is for ages 8 to adult. It comes with easy and challenging questions for the young and old, and best of all you can add your own commentary as the game progresses. Bowling an over is simulated by throwing a dice six times, and as the batsman moves around the board depending on the throw of the dice, runs and extras are scored and a batsman may lose his wicket. A cricket question determines when a batsman actually loses his wicket. The batsman must answer the question incorrectly to lose his wicket. It captures the history and tradition of the "on field" game in an easy but competitive manner that typifies the Caribbean way of life. It is extremely cosmopolitan because it can be very easily modified to suit any region or market and will therefore be loved by every cricket fan from nine to ninety years, from Barbados to Bombay to Sidney to South Africa. 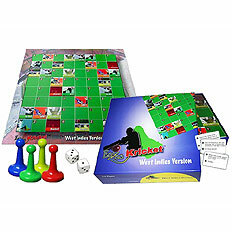 EeZee Kricket can also be used by teachers and coaches of cricket to teach their team the history of the game in an exciting and stress-free manner. Students will find this game extremely fascinating to play and very educational at the same time. It is an excellent promotional tool to promote the game of cricket, and the fact that it can be modified to suit a particular market without compromising its original intent is an extremely valuable feature. The game will never get old, as there will be expansion question packs with intriguing and challenging questions for both the young and the old.